The first three levels of the game are a complete wash. Really - they're as bogus as it gets, nothing but busy work. I recommend players max each level and use this time to trophy push as high as you can. Watch a movie and just keep on attacking. After about a week, you'll have everything maxed to BH3 standards, be hanging out at about 1000 trophies, and can move up to BH4. I wouldn't worry about walls yet; just dump gold while you finish off your troops. I go to BH4 with level 2 walls. Be sure to use the last attack cycle or two to fill your storages though; you need to get the additional storage capacity first thing at BH4 so you can buy the fourth Army Camp. BH4 is a good place to really set the groundwork for your remaining game. In a lot of ways, BH4 reminds me of TH7 on the main game. You get Baby Dragons and can take all of your troops to level 8. The base layout is pretty straightforward but not strong enough to really require much thought when attacking. It's also really easy to near-max and you'll end up around 1600-1800 trophies if you work on it (and that's without trophy pushing, BTW). Sure, you'll end up going up against BH5s by the time you hit the mid-way point of your BH4 adventure but, if you focus on getting those troops upgraded, you'll wipe the game grid with hyper-rushed BH5s with ease. By the time you've maxed Boxer Giants, Raged Barbarians, Sneaky Archers, Baby Dragons, and Beta Minions, your base will be nearly maxed as well. My BH4 games easily max everything but walls on BH4 in the time it takes me to max all of my troops and that's all at the 1600-1800 trophy range. (I only take walls to level 3 at BH4.) Feel free to give them a look - ClashManiac, ZedVerteidigung, and NaidCosanta are all BH4 right now. My upgrade path for defense structures is pretty straightforward - point defenses first (starting with air), followed by splash defenses (also starting with air), then everything else. As soon as my troops are in good shape, I move up to BH5. Now, in the past, I would just drop everything new, upgrade it all to BH4 standards, get Baby Dragons, Beta Minions, Raged Barbarians, and Sneaky Archers to level 10, then go to BH6. Having spent some time at BH6 on my main game (Noctaire), I've decided to be a bit more conservative and hang around BH5 a while. I doubt I'll actually max it, but I am maxing my troops and point defenses this time (Hidden Tesla, Cannons, Double Cannons, Archer Tower, Firecrackers). My BH5 games are comfortably hanging out around 2500-2700 trophies; not quite max loot, but we're only talking a small difference. Taking the time to better develop at BH5 is a response to the current meta. As I said - there is absolutely no penalty associated with rushing on the BB (unless you hyper rush with all level 1 defenses and troops, of course). I've found that BH5 and BH6 are heavy with the air game, so getting air defenses to BH5 levels and pushing point defenses to max as well just makes sense. My BH6 game is currently cruising at 4200 trophies. The key to getting to 4000 was level 5 Firecrackers. No two ifs, ands, or buts about it - until I got the Firecrackers to level 5, I could not make it over 3500. To further strengthen my air defenses, I set all of my mines to air and maxed them as well. I still take a pounding, still lose a few along the way, but I win far more than I lose and a lot of attackers get hit fast. BH1 thru BH3 - max everything except walls, trophy push, fill storages before going to BH4 or while the BH4 upgrade is underway. 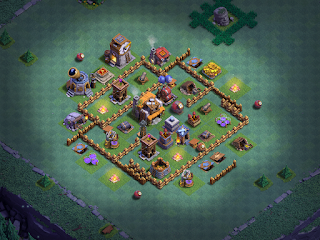 BH4 - Max troops, walls to level 3, max as many structures as you can while troops are upgrading (starting with storages and Army Camp). BH5 - Max troops, ignore walls, max point defenses, take all splash defenses to level 4, pull the trigger on BH6. BH6 - Make sure everything is at least level 4, max air defenses, get everything to BH5 max, max point defenses, max splash defenses. Of course, that leaves resource structures and traps/mines. You'll need to upgrade your resource storages early in each upgrade sequence so you can store elixir/gold enough to power your upgrades or buy new items. As such, I usually upgrade elixir storages quickly - often first thing - and gold storages about mid-way in, when I finally need them for a defense structure upgrade. The Gold Mine and Elixir Collector though...they're just filler. Same goes for traps and mines during the first four levels; they're filler until they really become necessary at BH5. Now, you might be asking...where do support buildings (Clock Tower, Gem Mine) and the Battle Machine fit into this strategy? You want to get support buildings repaired as soon as you can just to have their HP to keep enemy troops busy. The reality, though - neither the Clock Tower nor the Gem Mine have any other real value. The only reason my Clock Tower is upgraded on my games right now is because I maxed it before it was nerfed into oblivion. Once you have the Gem Mine, it will essentially give you one gem a day. Whoopdeedoo. I use these to slow down enemy troops and that's it. They're almost filler themselves; they get repaired when I have enough gold but don't have anything in particular to upgrade, usually when I have leftover gold. The Battle Machine...that's one you'll have to decide for yourself. I flat gemmed it on my main game - I did the first three levels through raiding and realized it was killing my progress; I did not want to take the time and elixir to upgrade it. The Battle Machine will cost you a solid two weeks+ of elixir production time at BH5 because of the loot cap (build time isn't that bad). He costs 900K, 1M, 1.1M, 1.2M, and 1.3M for each upgrade. If you're running around 2500 trophies or thereabouts, your daily loot cap is going to be 330K. That means 3 days to repair the Battle Machine, then 3 more to get enough for the first upgrade, 4 more for the second upgrade, 3 for the third upgrade, and 4 to go to level 5. That's 17 days of elixir production to get him to level 5. Right now, every one of my BH5 games has a level 1 Battle Machine. Even Nachtherr which is nearing BH5 max (except walls) has a level 1 Battle Machine. And these games are all holding steady around 2500-2700 trophies. The Battle Machine is useful, but not necessary until later in BH6. When you decide to upgrade him is really up to you. I am debating this one internally at the moment. My inclination, since these are NOT my main game, is to max all of my troops then start dumping elixir into the Battle Machine and gold into walls (once all structures are maxed, of course). The meta is good right now, so I can do this if I want to. Some players choose to focus on the Battle Machine as soon as they have a couple of good, solid attacks maxed (typically Beta Minions and Baby Dragons). That's a smart strategy too. This is where you'll need to decide how aggressively you want to rush on the BB. The simple reality is that you COULD drop everything and pull the upgrade trigger right away, maxing it all at BH6. You could just upgrade two attacks, take the Battle Machine to level 5, and upgrade whatever is on the base while you wait for the elixir upgrades to finish (I still recommend going air, then point defenses, then splash defenses). Either way will work. The ultimate rushing strategy will get you to BH6 very quickly - drop, upgrade the minimum amount, upgrade the BH...lather, rinse, repeat. I'll be doing that on another account here soon just to show it can be done. Personally...I don't find this to be very fun or rewarding. Lots of players are doing it, though, and this accounts for a fair number of low-trophy ranking BH6 games. In all cases, choose a path that works well for you and makes the game enjoyable. If you rush so fast you spend hours each day losing attacks...that's no fun. If you max/near-max and spend hours losing attacks...that's no fun either. Find the balance that works for you and go from there!